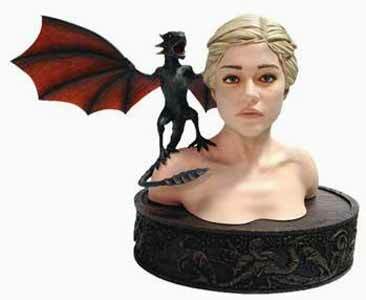 Game of Thrones: Daenerys Bust is an impressive 7 inch tall ornament that will find pride of place on any Game of Thrones fan's collection. 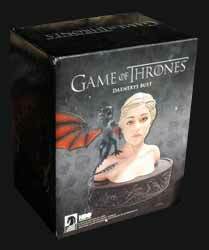 Sculpted by Gentle Giant Studios, this is a beautiful and very faithful likeness of Daenerys. The sculpture comes in two pieces which allows for it to be disassembled and placed back in the well padded box for moving. 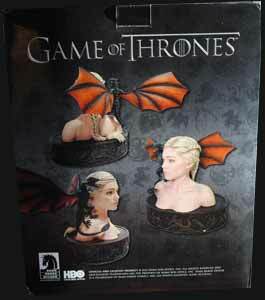 The baby dragon appears to be made from hard plastic (which is just as well as it's incredibly fragile looking) while the main bust appears to be made of plaster. The detail is impressive and I loved the intricate sculpting around the base, which mimics old carved wood, which is made to look like an elaborate tapestry element from the opening sequence of the TV show. The review copy we were sent on loan had done the rounds a bit and I was impressed to see that the only damage done was obviously by idiots that had tried to glue the dragon to the body which made putting the sculpture back in the box impossible - the resulting broken elements were down to this rather foolish venture. This just goes to show that the bust is incredibly hard wearing and those that are buying it to lovingly take care off will have to be pretty rough with it to cause it any permanent damage.